I’ll be the first to admit that there had been a sea change in Ms. Lennox’ vocals by the time of the “Sweet Dreams” album. It was on that album that she delved into the sometimes tricky “white soul” territory. This was not helped at all by her facility with singing. I tend to distrust singers who are technically accomplished, because there is the possibility of them leaning on their singing ability and coasting artistically when at the end of the day I am most interested in the caliber of their ideas. Fortunately, the music that surrounded her excursions into melisma on the “Sweet Dreams” and “Touch” albums was as far removed from mainstream R+B/Rock as possible at the time. In deed, the juxtaposition between her singing and the songs, accompaniment, and production style offered much to dig deeply into. The first four Eurythmics albums were high on the scale of offering hybrid vigor. Not so with “Be Yourself Tonight.” Like numerous bands where I was hearing their music for the first time on a CD [what was up with that?] the first music of theirs I’d hear on a CD was their worst. Overly mannered vocals combined with absolutely boring rawk + soul music. The nadir was the forced feminist anthem “Sisters Are Doing It For Themselves.” Clive Davis of Arista has long been convinced that the path forward with heritage acts like Aretha Franklin, was to pair them up with “young turks” and get ready to count the money. It says a lot that an old, out of touch guy like Davis thought that Eurythmics by 1985 were “edgy” and the combination of them at their most conciliatory with the first lady of soul was like oil on water. Never mind the fact that Ms. Franklin had issues with the perfunctorily feminist lyric and lobbied for them to “tone it down” a little! The next move was the it-had-to-be-better [but only just] “Revenge” album. I actually had tickets to see the band at this point, but the tour was cancelled for some health reasons and I am thankful to this day that I missed it. By 1986, I was bearing enough scars from “finally” seeing groups like Simple Minds, Echo + The Bunnymen, and Psychedelic Furs when their artistic fortunes were also at low ebb, so this was a kindness from the universe. Imagine my surprise when the next Eurythmics album was actually their finest! I cannot stress how miraculous it seemed for the band to go from the doldrums of mediocrity to bold, powerful artistic statements couched once again in electronics and married to powerful lyrical sentiments. Naturally, this was the album that ended their winning streak in America, but they had just made the greatest artistic volte-face I’d ever heard, and the fires were re-kindled. This time I bought their singles on CD format, which I also appreciated. The album had a powerful video album where each song had a film and that got a Laserdisc release in Japan, much to my delight. The bulk of it has never made the leap to DVD as of yet. I wondered where things would go next for the revitalized band. As it turned out, Clive Davis came a’calling and the band made the move from RCA/BMG to Arista. I KNEW that you would back up from the edge, Monk, and show Savage the “love” it deserves! I agree with your assessment of Clive Davis. He may have paid his stable of older R&B acts good money, but was the constant “lending them out” any better than the way they were treated in the 50s and 60s…not really. I’d much rather see Lady Aretha exercising her pipes on Nessun Dorma than standing in place while George Michael or Annie Lennox prance around her. Echorich – Don’t get me started on Davis! I read his recent autobio as a non fan and it made me dislike him even more. So arrogant and convinced that a lawyer knew better than his artists! So full of “plantation owner mentality.” Only Patti Smith and Lou Reed escaped his machinations if only because he was truly cowed by their artistry. I will say that he did no damage to Smith but actually facilitated her art, for a change. 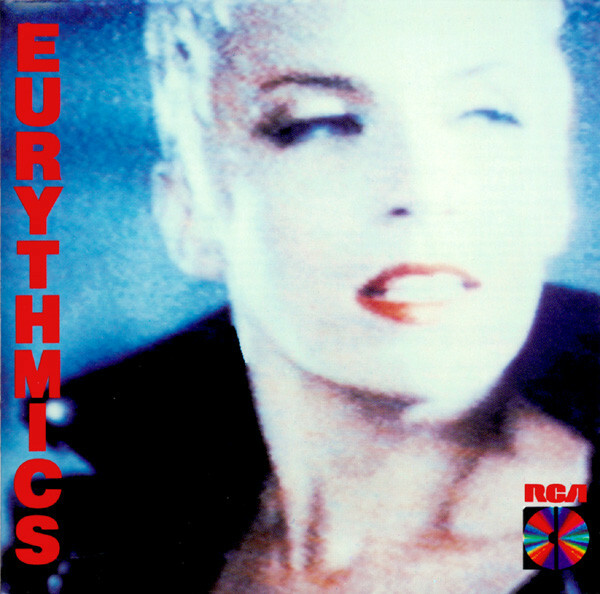 As much as I loved the early Eurythmics albums, I had kind of given up on them after hearing “Be Yourself Tonight” and “Revenge.” And then “Beethoven” was released and I was completely taken aback, and enamored. It was almost too good to believe, this band that, at least to my tastes, wandered far off, and then they came back with *this*. And I liked the next single, “Shame,” almost as much. The whole album is a treat. Aside from Beethoven, my favorite track on it is “Heaven,” which I love listening to cranked up as loud as my ears can handle. Yes, mostly agreed. I too found “Sisters …” contrived and annoying. But I actually rather enjoyed the rock-pop of “Would I Lie to You?”, and yes, “It’s Alright” had a very dreamy infectious vibe. I never bought the album, so I can’t comment on any of the album tracks. I wasn’t much of a fan of the “Revenge” singles either, a bit soft and fluffy, and again, I didn’t buy the album. 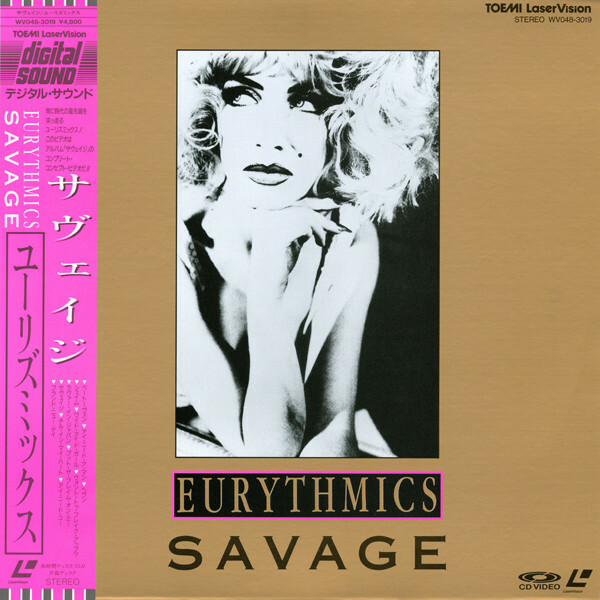 But I totally agree with “Savage”, a slick and dark slice of electronic pop, and I bought the album on CD, and loved the video album, how they all segued. Love the “Heaven” song, especially, and the two singles. Real shame you can’t get the video album on DVD. I have it on VHS. I should probably get it digitised, maybe there’s some kind of publishing issue which has prevented the DVD release? Still a huge fan of the “Sweet Dreams” and “Touch” albums, which I bought on vinyl at the time. Also, the “Touch” remix album, excellent also. “Who’s that Girl?” is probably my all-time fave song of theirs. Bryn. Two singles? Maybe elsewhere, but in the UK four singles were released off Savage. They were ‘Beethoven(I Love To Listen To)’, ‘Shame’, ‘I Need A Man’ and ‘You Have Placed A Chill In My Heart’. A cracking album indeed. Ahh, yes, “You Have Placed a Chill in My HEart”, I’d forgotten that one. Don’t remember “Shame” as a single in NZ though.